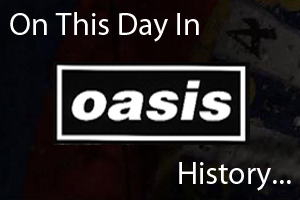 On March 22nd 1996 Oasis played the first of two dates at The Point Depot in Dublin, Ireland. Following the gig Noel Gallagher appeared on The Late Late Show for a short interview and played two acoustic songs. On March 22nd 2009 Oasis played at the Makomanai Ice Arena in Sapporo, Japan. During the gig Noel Gallagher played 'Whatever' it was the first time in seven years they had included the song in the set.